Directed by Jean-Marc Abela & Mark McGuire, 2009, 42 minutes. 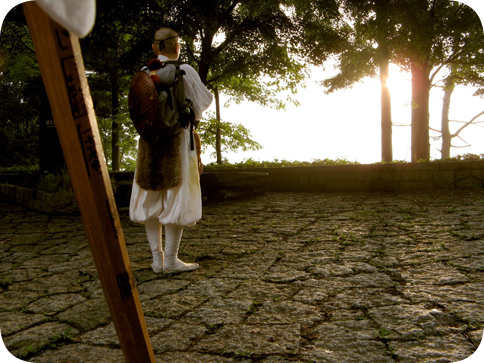 Shugendō Now is a documentary that walks the line between illustrating transcendent spiritual practice and the everyday “world of desires and illusions.” It is clear from the very beginning that nature holds a prominent role in the film. The film follows a pilgrimage of lay practitioners mostly from the urban environments of Tokyo and Osaka. Guided by Tanaka Riten from Kimpusen-ji temple, the pilgrims, in a practice called the Lotus Ascent, ascend Mt. Ōmine, one of Japan’s sacred mountains. Commenting on the effort to invite more people to practice shugyō (ascetic practice), the Shugendo priest observes “that with the increase in participation by everyday people, we’ve seen a decline in participation by more seasoned ascetic practitioners.” As the film follows the pilgrimage we are given a glimpse into the private lives of both lay people and mountain ascetics. Tateishi Kōshō, both a mountain ascetic and a family man, functions as the film’s central figure and the head of his own temple Sangakurin, or Forest of Mountain Learning. Kōshō-san takes the viewer to environmental cleanup sites and introduces his eco-logic philosophy; a philosophy of sustainability, awareness, and purification. Although Kōshō-san is highly disciplined and serious, we also see him fully engaged in the everyday life of friends and family. His personality shines throughout and we easily believe that this man is a perfect example of what a Shugendō practitioner aspires to achieve. The ascetic practices of the Shugendō lay people, most of whom are from large cities, help them gain insight into the void formed by their alienation from nature. Miyamoto-san comes to understand how his concrete business is dangerous to people and the environment; Suzuki-san heals her shattered nerves from the stress of the business world; and many other followers reveal the ways mountain worship has personally affected their lives and bestowed a sense of fulfillment by reconnecting them with nature. The film, while wonderfully refreshing, challenges the viewer by asking him to remain alert while simultaneously surrendering to the ephemeral moments between its chapters. The relaxing music and picturesque scenery risk lulling the viewer into a dreamlike state which threatens to dull one’s attentiveness to the delicately woven story of the interconnectedness of nature and society. Perhaps that is what the film in fact intends. This film is more than a voyeuristic documentary about monks on a spiritual pilgrimage; it invites the viewer to join in and take part in the journey. I appreciated this aspect of the film because we see both sides of the ascetic life: the pilgrimage as documented in the Lotus Ascent, coupled with everyday life, as demonstrated in a wonderful chapter with Kōshō-san called “Cooking Show.” In this scene, Kōshō-san takes a break from his daily regimen to prepare a vegetarian dinner for his guests while drinking sake and joking with the film crew. Scenes such as this in conjunction with a brief glimpse into the lives of other lay practitioners gently challenge our preconceived notions of what we may think an ascetic life means. Shugendō Now could be used by college and some high school educators to highlight either the history and syncretic nature of Japanese religions, or Japan’s environmental concerns. This full-length version is divided in twenty-eight short chapters making chapter selection during class viewing manageable when the full ninety minutes are unavailable. There are also two educator versions, each 45 minutes in length, one focusing on the religious pilgrimage, the other on nature and the environment. Kevin Taylor is a graduate student studying Japanese religions and ecology in the department of East Asian Languages and Cultures at the University of Illinois. He also has a Master of Arts in Philosophy from Southern Illinois University with a concentration in Buddhist philosophy. Includes institutional public performance rights.